Nebuchadnezzar’s request was totally out of line with reality. He not only wanted to know the meaning of the dream, he didn’t want to tell his advisors about the dream. Putting myself in their place, I, too, would rant against the impossible and unreasonable request. Life seems to make unfair demands upon us all the time. Sometimes it is people who make the demands, sometimes we find ourselves in situations where every option and choice seems unfair. The astrologers had it right – there isn’t a man alive who could tell them the dream…or so they thought. Daniel was alive. What can we learn from this? SECOND: unfair things happen. There’s not much we can do about them. We should probably expect them, and while we may protest against them, in the final analysis, we didn’t ask for the situation nor do we have answers for it. Such, as they say, is life. 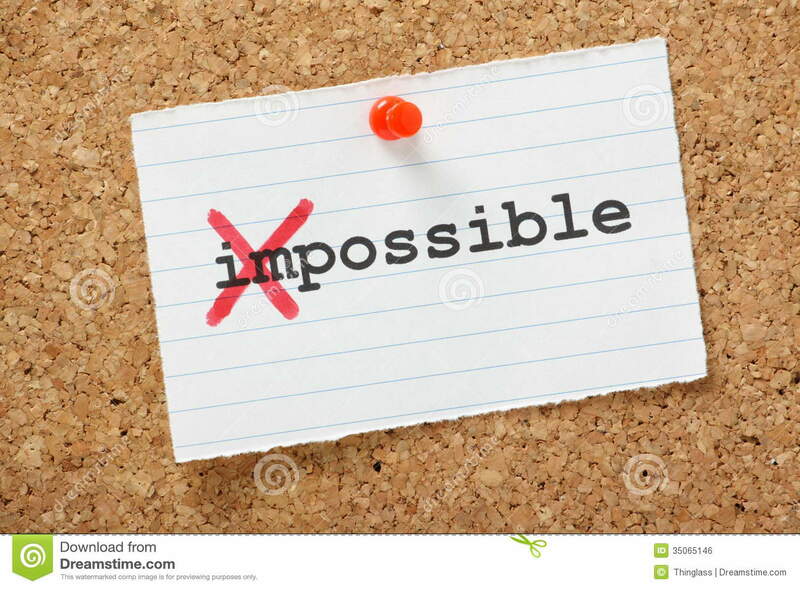 THIRDLY: when God is put back into the picture, the impossible becomes possible. And with Him in the picture, while we may still protest the unfairness, we can also understand that God’s hand has permitted it. The astrologers, and our culture, desperately needed answers. Sadly, neither look to the right place for them. If our culture needs anything, it needs Jesus. Some argue for putting the 10 Commandments back into the mainstream of life, arguing that if we could post them in schools and court houses, city buildings and corporate centers, then the “good life” would return and our country would get back on track. While I agree it is sad and tragic that God’s words are banned from public places, simply displaying them won’t make a bit of difference. God Himself, in the person of Christ, is the answer. The indwelling Spirit of God, the Lamb of the World engraved on our hearts, is what America and the world need, not the 10 commandments or any other such list. We need the change that comes only from within the human heart – that starts there and that changes what it finds there. It is impossible for men to make the change in culture for one reason – we can’t even make the change in ourselves. It is impossible for any person to do so – but let’s not make the mistake the astrologers did and forget that there is a God who can do all things that we humans find impossible. PRAYER: Lord, today we’ll be faced with situations that, at the very least, don’t seem to be fair! Help us to not think we know more than we do about such things, let us realize that even in the midst of unfair situations, we are still called to be and act like Your children, and let us never give up hope that You will act in due time. Help us to be like the astrologers insomuch as we will never foolishly place our trust in man. May we rest in You! In Jesus’ name, Amen. Job 38:4-7 (NIV) – Where were you when I laid the earth’s foundation? Tell me, if you understand. Who marked off its dimensions? Surely you know! Who stretched a measuring line across it? On what were its footings set, or who laid its cornerstone–while the morning stars sang together and all the angels shouted for joy? Psalms 19:1-2 (NIV) – The heavens declare the glory of God; the skies proclaim the work of his hands. Day after day they pour forth speech; night after night they display knowledge. When did all this happen? We might be tempted to think that it happened before the fall of Satan and the realization of evil in the created universe. After all, wouldn’t it make sense that God’s glorious creation would praise him? Should we be so arrogant to think that only humans and angels can do so? It may be true that they sang for joy at the creation and before the fall, for we’re also told through the word that the entire creation now groans and travails in pain, awaiting deliverance that will some day surely come! But in the meantime, if we’re quiet enough for long enough, you’ll still hear singing. You’ll hear it with your ears as the animals, wind and sea sing, you’ll hear it with your heart as you look up at the starry canvas on a warm summer night. And, for those who have ears to hear, we can hear it in the sub-human range of the song of the sun and other stars that sang in the very beginning. Big Things with small voices, indeed! PRAYER: Thank you, Lord, for the music of the spheres and for the song of love that You sing to us! In Jesus’ name, Amen. Tears. Sorrow. Grief. Three words that we hope don’t come anywhere near us, for when they do they are always unwelcome visitors. Would that life were always full of joy, happiness and laughter! That is, after all, how God intended for life to be, and how it will someday again be for those who love Him! In the meantime, we are awaiting that revealing and dawning. And as the ocean is full of water, so our lives are full of tears. It doesn’t take much for me to cry. I am sometimes embarrassed by my readiness to cry, wishing that I were more stoic, that perhaps things didn’t affect me as much. Those are usually times when I am in a public situation, sometimes in the pulpit, or at the beside of a person in great pain and facing death. What can you say to someone who is crushed, broken hearted by loss or some great sorrow? I know I struggle to find words. They do, too. 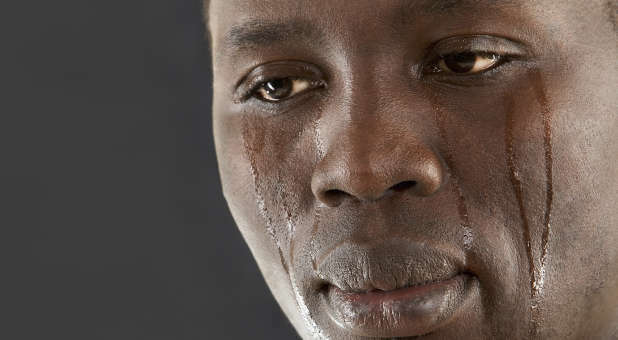 They may be crying, and yet they still seem to be able to say, “I’m sorry for crying.” I usually am quick to assure them that tears are not bad. Jesus cried. And I tell them that tears are a part of the language of love, for if we did not love, we would not weep with loss. The sorrow that produces weeping is a gift, for it reveals what is in our hearts, and if nothing else, surely it must be proof of the truth of a love that may have even gone unexpressed in happier times. Let your tears flow when you need to cry. They are part of God’s heart, too. PRAYER: Lord, may we join in the weeping that comes from your heart for this broken and bloody world of darkness and loss. May we weep unashamedly because of the love that you put into our hearts for You and those around us. And may we also weep for our brokenness. In Jesus’ name, Amen. Yesterday I wrote about Jesus’ triumphant cry from the cross, “It is finished!” Today I want to think about sound again, but in a bit different vein. On August 27, 1883, the earth made a noise unlike anything since. On that date, on the island of Krakatoa, a volcano erupted violently. It threw rock and ash 17 miles into the atmosphere (reported by a geologist who witnessed the eruption), created a tsunami 100 feet high, and the noise was heard audibly over a mass equivalent to 1/13th of the entire world. Another way to put it is this: it was heard by people 3000 miles away! 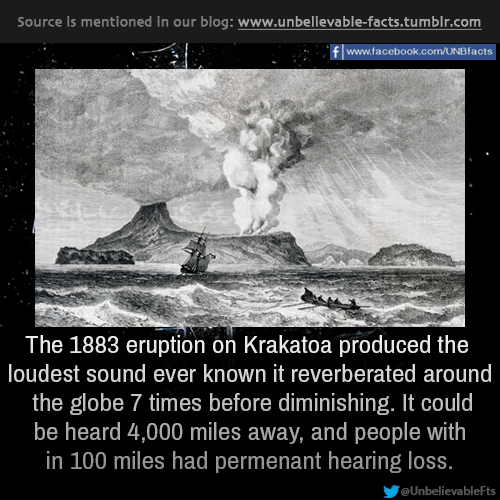 A British ship captain who was 40 miles from the volcano when it blew reported that the noise was so loud that over half of his crew had their eardrums ruptured by the volume of the sound. He wrote, “My last thoughts are with my dear wife. I am convinced that the Day of Judgment has come.” No wonder he felt that way – the sound is believed to have been equivalent to 100,000 hydrogen bombs exploding simultaneously. The angels roar for Christ the King. It dawned on me that though the loudest noise ever recorded on earth may have been Krakatoa, the loudest noise in the universe must surely have been the roar the angels made when they realized that Christ had arisen! What a contrast it must have been to the stunned silence when they witnessed God’s Son die! Is it any wonder that they roared when he came back to life with the defeat of death firmly in his grasp? I doubt that they’ve stopped roaring yet. PRAYER: Father, how I long to hear the roar of praise for Jesus pouring from the mouths of the angels, and to join my own praise to that sound that will swell and grow forever and ever! In Jesus’ name, Amen. DayBreaks for 5/24/17 – The Shout of Victory! John 19:30 (NIV) – When he had received the drink, Jesus said, “It is finished.” With that, he bowed his head and gave up his spirit. The final words of Jesus from the cross have often been misconstrued. Some movies have pictured Christ, with uplifted eyes, croaking out softly, resignedly, “It is finished” and then bowing his head and dying. I don’t believe that is an accurate picture at all, and here’s why: when we compare the four gospels we find a very interesting thing. The other three do not tell us that Jesus said, “It is finished.” But what they do tell us that he died with a great shout upon his lips. John doesn’t speak of a great shout, but instead tells us that Jesus’ very last words were, “It is finished.” We can safely conclude that the great shout and the words “It is finished,” are one and the same thing. In Greek, “It is finished” is one word — tetelestai — and that’s what Jesus shouted. It was no meek or resignedly defeated word that he spoke. He didn’t say, “It is finished,” in weary defeat; he shouted it out just like a person shouts for joy because the victory is won! He seemed to be broken on the Cross, but he was NOT! He was victorious on the cross! Just in case you think I might be wrong, there’s another strong clue that makes this concept even more certain. John says that Jesus bowed his head and gave up his spirit. The word that John uses is the word that was often used to describe someone setting their head back upon a pillow and entering into rest. For Jesus the strife was over and the battle was won; and even on the Cross he knew the joy of victory and the well-deserved rest of one who has completed his task and can lean back, content and at peace. What a wonderful picture – not of a quiet, broken Jesus on the cross, but of one who knows that it is finished, that it has been finished well, that it will never have to be repeated again. The price for my sin has ALL been paid! 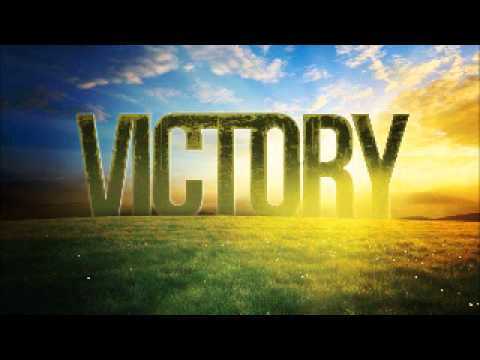 PRAYER: Will we ever really grasp the victory that was won on Your cross, Lord? We hang our heads in shame that you had to pay such a price for us, yet we lift our eyes to you in gratitude and wonder for your love. May we echo your words, “It is finished!” regarding our sinfulness. In Jesus’ name, Amen. Why was it necessary that Christ should be so beaten and disfigured that he was barely recognizable as a human being? I’m not sure, I can only speculate. But in his death, if he had been recognizable as himself, with his own distinct features still clearly visible, his face would not be that of every man…he would still be someone distinct. But by having his features nearly wiped off his face, he bore the image of degraded, disfigured Everyman. The soldiers and lookie-loo’s saw Jesus, the one they had pierced, but we, too shall see him – and when we do, we shall realize that we, too, pierced him. We pierced him on the cross by the sin of our hatred and rebellion to God, we pierce his heart of love every day when we sin against the love of God and His will. And the day will come when we, too, shall lift up our eyes and see the One we pierced. What we see in return will depend on what we’ve done with Jesus in this life – if we’ve confessed our sinfulness and asked His forgiveness – letting him be the Lord of our life, or on the other hand, if we proudly refuse to bow the knee and ask his forgiveness, we will not be happy to see him. May I always be reminded that my eyes, too, shall look upon the one that they, and I, have pierced, and that he looks upon me. PRAYER: Forgive us, Jesus. We know not what we do. Thank you for such love, grace and mercy! In Jesus’ name, Amen. DayBreaks for 5/22/17: He Is My All? We are told that when we sing we are to sing with both the Spirit and the understanding. I wonder how often we really do that. We know so many of the songs by heart that we can sing them in our sleep – and I fear that perhaps we are often sleeping through the words we are singing in worship as a result. It is a very powerful claim to be making that “Jesus, You’re all to us.” How I hope it is true – and I hope we aren’t singing those things mindlessly because God is listening and knows whether it is true or not. The person standing next to you probably can’t tell if it’s true or not, but God knows. Every. Single. Time. As one of our worship leaders wrote: “When someone or something is our “ALL” or our “EVERYTHING”, it’s obvious to those around us. There’s no mistaking it. They are the topic of our conversations. They occupy much of our mental real estate. Our decisions hinge greatly upon this person or this thing. There is NO doubt when one is impassioned…driven…consumed. How did you do with that simple little test? When you make the claim that Jesus is everything to you, that he is all that matters, it should be obvious to everyone around us. Does putting the word “Christ” in those blanks really sound like the real you? Does it ring with truth, or does it reveal to your heart that perhaps He isn’t your all, your everything? Is it just something you sing or say mindlessly? I realize that we must grow into loving someone or something as time passes. I have found in my own life that the love I had for my wife or children or grandchildren has only grown with the passage of time. Is the same true for my love of Christ? I hope and pray that it is so and that it will be even more true was each new day passes. Until then, perhaps I should be a bit cautious when bragging how much Jesus means to me until my life reflects it a bit more. PRAYER: Jesus, for all the boastful things I have said about my love and devotion for you, please forgive me. Let it be true that someday I can honestly say that you are my everything. In Jesus’ name, Amen.